When I got my first period, at only 11 years of age, I remember thinking that there was something fundamentally wrong with me, all because my parents always shied away from discussing menstruation at home. The result was not just misinformation and paranoia, but a lack of understanding about how to adequately take care of my body during this period. Neither was I made aware of menstrual hygene, nor did I know of the complications or diseases I could be potentially exposed to if I didn’t follow certain safety measures until much later in life. This is what happens when parents forgo discussing menstruation with their adolescent and pre-adolescent children (especially young girls). When kids are not taught about menstruation before they experience it themselves, chances are, they’ll end up internalising a lot of harmful myths about the process, which might have long-term effects. But the sad thing is, discussions about menstruation still remain largely taboo in Indian households across the board. It’s not easy to remedy the centuries of stigma that has come to surround the topic of menstruation in our culture, but what we can do, is start by breaking the silence; which would involve parents talking to their kids about periods. The earlier one starts to talks to one’s child about the changes the body undergoes during puberty, the better. And since menstruation is such a major part of puberty for young girls, the same policy goes for it too. Every little detail about the body’s hormonal changes and the menstrual process can’t all be unleashed at one go, so it’s important to start slow, and to take one’s time going into each aspect of the phenomenon. Keep the tone conversational; come down to their level while talking about it. Illustrating it through diagrams, metaphors, or stories are always good learning aids for the child. Besides this, it’s always good to give them more practical information alongside explaining the biology of it — telling them when periods might happen, what kind of symptoms they might cause, what kind of precautions to take, and so on. But what’s most important to remember, is encouraging the child to ask questions and answering them with as much clarity as possible. Multiple Indian traditions involve ostracizing women during their cycle. There are communities or religious groups who believe that a menstruating woman can’t touch certain food items, or can’t enter temples or other places of worship. Menstruating women are also sometimes kept in isolation. All such practices are nothing but regressive, deeply misogynistic, and an attempt to demonise a bodily function that is both natural and necessary to women. Hence, to enforce such practices at home is utterly unadvisable, because not only is that reinforcing a certain patriarchal norm about the female body, but is also harming your child’s sense of body image or mental health. When your kid gets her first period, one shouldn’t immediately impose only one particular form of menstrual protection. Introduce to them to all three things – the pad, the tampon, and the menstrual cup – and let them decide what they are most comfortable using. A lot of culture or communities (including ours) consider tampons immoral, because of the misconception that tampons may potentially “break the hymen” and affect a girl’s “virginity”, which is why a sanitary pad is their commonly enforced option. But not only is this a deeply patriarchal myth, it also restricts young girls from a whole variety of menstrual protective products which they might end up preferring over the use of a sanitary napkin. Each person feels comfortable with a particular thing, so it’s important to give young girls the choice to pick what they want to use – a pad, a tampon, or a menstrual cup. Not only should the child be equipped to handle what a period is, but they should learn to handle themselves during that time, starting from their very first period. How can a parent empower them to do that? That’s a tricky question, but not entirely impossible to answer. As mentioned earlier, merely explaining the process in detail is not enough, one has to offer practical solutions as well. Teach them how to handle leaks and stains, how to deal with cramps (the answer to which is not always painkillers), what to do when the period occurs suddenly, to always carry extra period supplies with them when they’re outside home, and so on. And teach them all of this well in advance. This will help them be much more confident during their initial menstrual cycles and not panic unnecessarily. It’s not only young girls who need to be taught about periods, but young boys too. Sure, boys may not require the conversation in such graphic detail, but they do need to know what menstruation is, and that it is perfectly natural and normal. This will also help them be more respectful towards their female peers. 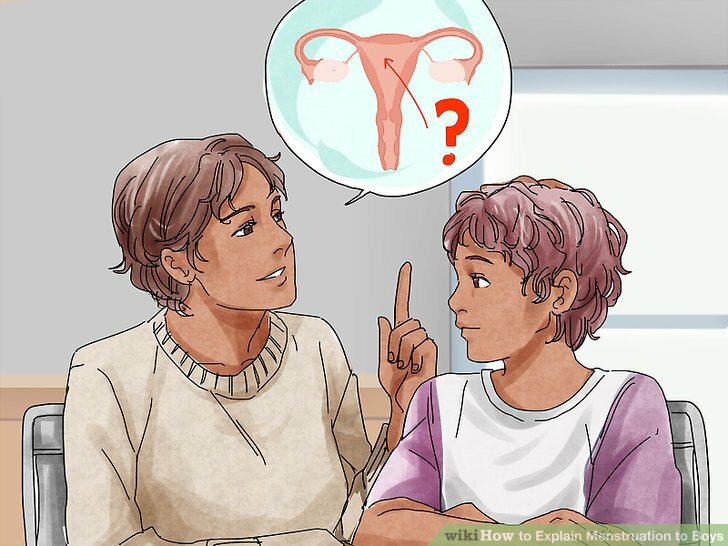 Similarly, if one has a daughter, then involve the father or the brother in the conversation about menstruation. Encourage young girls to be able to talk to their male family members about when they’re in the menstrual cycles, or when they need supplies for it; because that’s the only way these conversations will become truly normalised. The silence and taboo around menstruation not only leads to body image issues in young girls, but also perpetuates this feeling of shame, which should absolutely be dismantled. At the end of the day, menstruation is as customary a physical process as that of any other part of the human anatomy, and just because it is associated with a woman’s reproductive health, there should not be any kind of negative norm surrounding it. But to break this, we need to ensure that our children aren’t indoctrinated into the same harmful stereotypes. We need to break the silence.